The Trump administration has vowed to comply with a court order implementing a strict time frame for reuniting immigrant children that it had separated from its parents, though it said meeting such an “artificial” schedule would come with a significant cost. 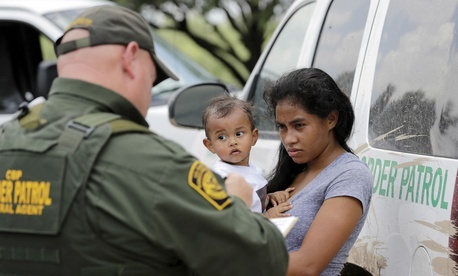 The Health and Human Services Department has in its custody fewer than the 3,000 minors the Homeland Security Department separated from parents illegally entering the United States, Alex Azar, the agency’s secretary, told reporters on a conference call Thursday. Azar could not say exactly how many children HHS does have, however. His reference to 3,000 minors appeared to mark an increase from the administration’s previous estimate, when it said 2,300 children had been separated from their families at the border and 500 had been reunited. Azar clarified those children were never transferred to HHS custody and none of the minors sent to the department have been reunited with families. A federal judge in California last week granted a preliminary injunction against the administration’s separation policy, mandating that all children be reunited with their parents within 30 days of the order. Minors under the age of five must be reunited within 14 days, meaning those actions must take place next week. While Azar pledged to meet those mandates, he said it would prevent his department from carrying out the oversight it typically requires. HHS is conducting DNA tests to ensure immigrants are actually the parents of the children they claim, but Azar said it may not meet its normal vetting standards due to the judge’s order. Customs and Border Protection typically makes the arrests of immigrants illegally crossing the border. Immigration and Customs Enforcement detains the parents and HHS finds sponsors to house children or places them in their own facilities. Azar said on Thursday some children will be sent to ICE facilities in order to comply with the recent court order. In mid-June, President Trump issued an executive order to end the family separation policy. HHS’ Office of Refugee Resettlement is responsible for finding placements for undocumented children migrating into the United States. As of last week, HHS said all of the separated children were “being cared for in HHS-funded facilities.” The department is also responsible for unaccompanied minors who arrive in the country without a parent or guardian. HHS said all minors are given the opportunity to speak with “a vetted parent, guardian or relative” within 24 hours of arriving at one of the department’s facilities either by telephone or video. Attorneys representing the minors are, in theory, granted unlimited telephone access with them. Azar testified last week that he can find any separated child “within seconds” in a database HHS maintains in conjunction with Homeland Security. That database, according to DHS, includes how the minors “illegally entered the country” and, “to the extent possible,” information about and the location of the minor’s parent or guardian. Azar admitted on Thursday some children’s entries in the database do not accurately reflect whether they were separated from a parent upon entering the country. Lawmakers and attorneys on the ground at the southwest border continue to claim the Trump administration is painting an overly rosy picture. Reps. Elijah Cummings, D-Md., and Mark Meadows, R-N.C., issued a bipartisan letter to the heads of HHS, DHS and the Justice Department demanding details on the separated families, the detention centers, the status of their broader immigration cases and other information. They asked for briefings on those topics by July 19. Those representing the families said things have not improved, despite claims from the administration of a smooth interagency process. In one case, Lockwood said she had just on Wednesday determined the location of a separated child. For two weeks, agency officials said they had narrowed the location of the child to one of three facilities around the country. She was only able to finalize the exact facility after the mother was released on bond, but the two have still not yet been reunited. All of the children Lockwood is representing are between five and seven years old. She has successfully reunited one child, but only with an aunt. ICE and HHS officials have displayed rare candor in answering her questions, telling her they have not yet received any new guidance since the Trump administration’s zero tolerance policy first went into effect. Anyone claiming to be a sponsor must provide both their own fingerprints as well as those of all adults in their households. The same applies for copies of their driver licenses. That adds levels of complications for the would-be sponsors, who sometimes have to drive hours to the nearest fingerprinting facility or fear their own immigration status will be questioned in the process. Lockwood said agency officials have told her parents will have to go through the same steps to be reunited with their children. “It’s fear of not knowing who is taking care of their child,” she explained. In one case, she said, a mother went 21 days before even having the chance to speak on the phone with her separated child. She said she has not seen any signs of things improving.